These cloud databases provide non-relational simple but scalable data services to applications that want to live in a public cloud. While they currently exist in a rapidly expanding hype-bubble, it may well be that cloud databases represent the biggest paradigm shift in DBMS since the relational revolution in the 80s. Anyway, I was lucky enough to get a Google App Engine account and have been playing with the data access API. I wanted to load up some data I had in Oracle tables and after a bit of mucking around decided I'd write a general purpose loader which others might fine useful. To use it, you’ll need python 2.5 installed with the cx_oracle installation installed and – of course – you’ll need a Google App Engine account or at least the GAE SDK. The command creates an app.yaml file which defines a new application “emploader”. 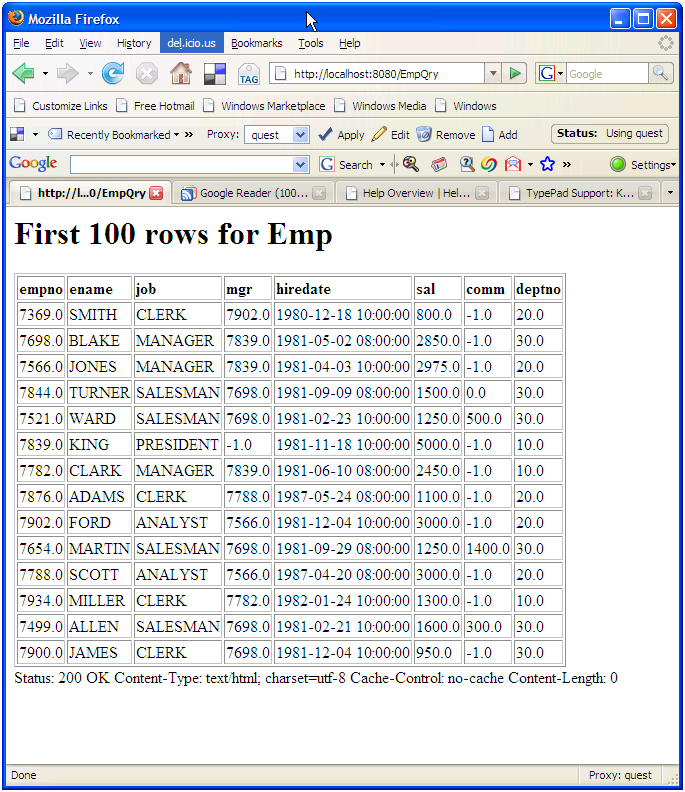 The application has two entry points; “EmpLoad”, used by the bulkload_client (see http://code.google.com/appengine/articles/bulkload.html) to load the data, and EmpQry which as a convenience displays the contents of the table. The LoadAll.bat or loadAll.sh scripts contains the commands to load the CSV file which contains the data from the EMP table. If you provide a SQL wildcard (eg “%”) then CSV files and entry points for all matching tables are created. INFO 2008-05-09 14:26:08,125 appcfg.py] Checking for updates to the SDK. 1. Numeric nulls are not supported by the bulkloader, so for now I’m setting null values to -1. 2. Unicode characters (I think) are causing the bulk loader to crash. Now that I can upload Oracle data to the Google App Engine cloud I’m planning to muck about with various query idioms such as joins, aggregates and so on. Should be fun! Is it allowed to host an adult website on Google App Engine? Is Google App Engine a viable platform for running enterprise level applications?